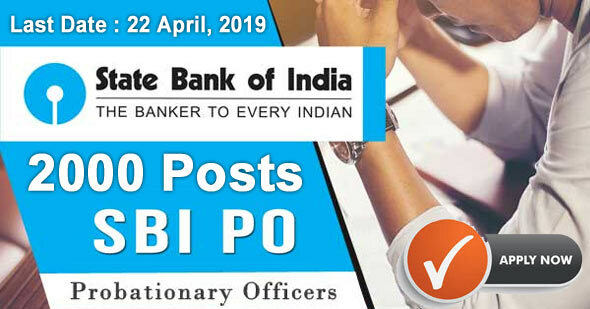 SBI Recruitment 2019 - Under State Bank of India (SBI), there are 2000 vacant posts for Probationary Officer, for these posts desired and eligible candidates are invited online application. Its recruitment advertisement/ notification no. is CRPD/ PO/ 2019-20/ 01. In respect of this recruitment, the vacant number of posts is 2000. Some among the given posts as per rule is reserved for the candidates of different categories. The number of posts may be decreased or increased. Starting date for online application registration is 02 April 2019, Date of application Fee deposit is 22 April 2019 and the last date for the application submission is 22 April 2019. For more information as about total no. of posts, age limit, educational qualification, selection process, application fee, important dates, how to apply etc., regarding this recruitment visit the official website of SBI https://www.sbi.co.in. On this website online application facility is available. Education Qualification : The eligibility criteria for the SBI exam is graduation degree in any of the streams such as BA, B.Com, BSc, B.Tech, etc., from a University recognized by the Government of India. Candidate who possesses the same qualification from the university recognized by the Central Government is also eligible to apply for this exam. For getting More Post wise Qualification Details Please See The Advertisement Details Below. Age Limit : The candidate’s age should be in between 21 to 30 Years As on 01-04-2019. The organization also provide upper age relaxation to the reserved category candidates as per the guidelines of the Government. More details please go to official notification. Pay Scale : The starting basic pay is Rs. 27,620/- (with 4 advance increments) in the scale of 23700-980/7-30560-1145/2-32850-1310/7-42020 applicable to Junior Management Grade Scale I. Application Fee : Rs. 100/- for SC/ST/PWD candidates. Rs. 600 /- for all others. Applicants have to make payment of application fee through the online mode (debit card/ credit card/ Internet Banking). Application fee will be non-refundable. Selection Process : Assortment of job finders for above posts will be based on their appearance in Written Exam (Pre & Main) and Group Exercises, Interview which will be conducted by State Bank of India on the stipulated date. Visit the official website of SBI (mentioned above). Select the recruitment of PO in SBI option. Click on the Apply now link. Hit the “click here for registration number” link. Fill the basic details and generate a registration number and password. Upload scanned copy of photograph and signature. Now enter all the personal, qualification details asked. Preview the details carefully before final submission. Make payment of the application fee. Take a printout of the receipt generated and application fee for future references. The hard copy of filled in application form is not required to be sent to the bank.